Home baking is a joy for children and adults. In addition to pies and cookies, at home you can do donuts. These delicious kruglyashi will not take a lot of time and effort and will delight your loved ones. Heat up the milk. No need to bring it to a boil, it should be slightly warm. Pour the milk in a deep bowl, add yeast and sugar. Stir the mixture and put in a warm place for half an hour. After this time the yeast will be given a hat. You can then proceed to the preparation of the test. Pour the desired amount of flour in another bowl. Melt the butter. To the flour add the milk with yeast, mix. Then add the egg yolks, melted butter, brandy and a pinch of salt. Knead the dough and leave to rise in a warm place for forty minutes, covering the bowl with a towel. Coming up take the dough and rolling pin. If the dough is watery, add some flour. It shall be suitable for rolling but not too steep. On a clean dry table, roll out the dough to seam half an inch. Cut out circles of dough using a glass. In each circle make a small hole in the center (glass or bottle). Separate round the resulting figures from each other and leave them to lie on the table in about twenty minutes. Preheat a skillet (deep frying pan) with a lot of oil. The oil should be close to 70-80 percent of the doughnut. In hot oil, not subtracting the fire, lay out the donuts. When frying, they should not touch each other. Fry the doughnuts on both sides for 1-2 minutes until Golden brown. 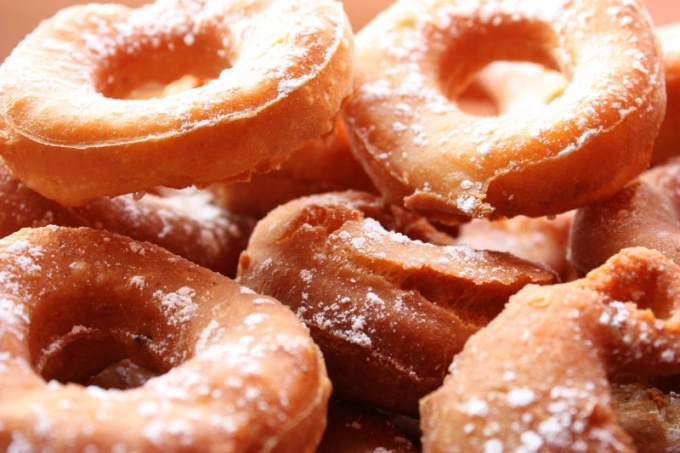 Lay the fried doughnuts on paper towels in order to drained excess oil. Then put them in a wide shallow dish and sprinkle with powdered sugar. Hot donuts will fit the milk to the cooled tea and coffee. Serve the doughnuts without filling, with cups filled with jam or preserves. Dessert lovers will appreciate this combination. Try to cook doughnuts without a hole in the center and filling. To do this, using a pastry syringe type in each donut, for example, jam or condensed milk.